Certification One Day Pass is a convenient and cost-effective package catered to Certiport certifications. The Pass helps you ensure certification success and offers the best value for the money you spend. What’s inside “Certification One Day Pass”? Certification One Day Pass is designed to help you ensure certification success. You will get a Certiport exam voucher (for MOS, ACU or ACA certification) with free retake (if applicable). You may take the exam by booking your preferred time, or take it as a group exam right after you finish the pre-exam workshop. You will prepare for certification success using GMetrix Practice Tests, which simulate the actual testing environment and increase your confidence in passing ACA, ACU and MOS certification exams. You will get a seat in an ACA, ACU or MOS Certification Workshop that provides exam drilling. Certification One-Day Pass costs HK$850. You will get a 50% ($425) discount if you are/were a student of a related Adobe course at Welkin. * We do not provide certification workshops for all exam titles, but you will still get a 50% discount if you want to take those exams without a workshop bundled. Get your One Day Pass now! Purchase your One Day Pass now to enjoy multiple benefits including Certification Workshop with Gmetrix Mock Exam and Free Exam Retake. 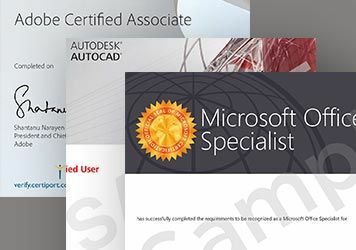 Get your Certification One Day Pass for only $425 (or $800 for Autodesk Certified Professional Certfication) if you are/were a Welkin or Form.Welkin student. Fill in the form below to enrol. * Certification workshops may not be available for all exam titles, but you will still get a 50% discount if you want to take those exams without a workshop bundled.